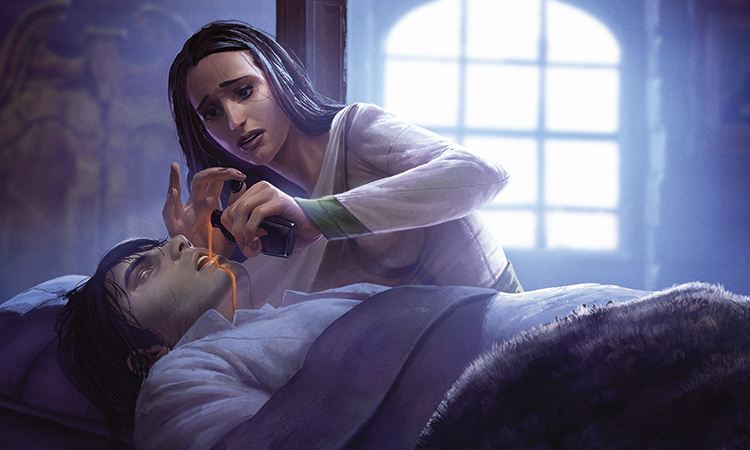 A man died somewhere nearby—too near—wasting his last breath on an inarticulate cry that only his killer and Liliana Vess could hear. Liliana hurried away from the sound, putting as many twisted trees between herself and the killer as she could. She'd grown up walking the tracks and trails of the Caligo Forest and knew them as well as anyone—certainly better than any of the soldiers fighting and dying under its branches now. Even at night, the woods felt like home to her, with owls and nightingales calling softly among the dark boughs. But on this night the forest had become a battlefield, and the only calls were the screams of the dying and the harsh croak of ravens squabbling over the flesh of the dead. She stopped and listened, straining her ears for any sound of pursuit, some indication that she'd been detected. No human soldier came behind her, she was sure—just one raven hopping and fluttering from branch to branch behind her, waiting for her to die. "Not tonight, bird," she whispered. "Josu is depending on me." The thought of her brother—delirious with fever as he lay on death's door back at their father's house—quickened her step, and soon the sounds of battle faded behind her. If no one else would brave the forest to find the esis root that would cure him, then Liliana would. "I'm ready," she told the bird. "I'll make him well, and together we'll crush these raiders." "Don't you laugh at me." She stooped to the ground and picked up a pebble to throw at it, but when she lifted her head the bird was gone. In its place stood a man, his features hidden in the shadows of his cowled coat. She threw the pebble anyway; it tapped his shoulder and fell back to the ground. He drew back his hood as Liliana fumbled with the knife at her belt. He was tall and had a noble air, dressed in a suit of black and gold that showed no signs of his passage through the trees and brambles. White hair crowned his head, tousled by his hood, but the hair at his temples was black and swept back over his ears. His eyes—strangely gold, like the embroidery on his clothing—seized and held her gaze. 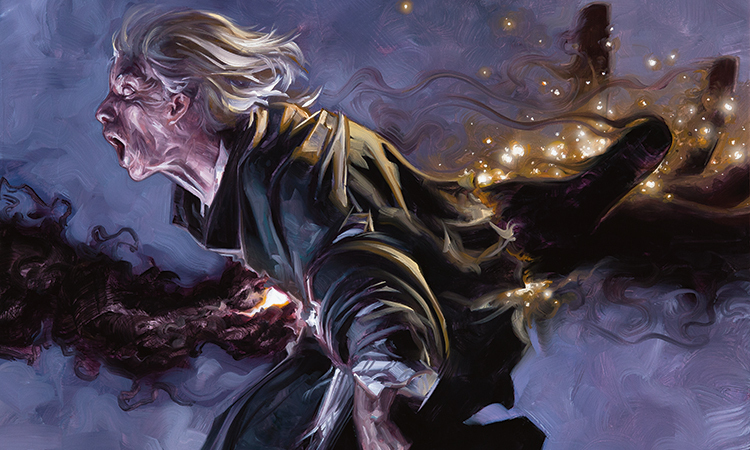 "I'm not here to harm you, Liliana Vess," the man said. "You know my name," she said, gripping her dagger. "Somehow that doesn't inspire me with trust." He held up his empty hands. "Your father is our lord and general. Of course I know you." "Like you, I'd rather lie low in the woods than end up a headless corpse dragged behind the horses of your father's foes, my skin stretched over their shields and my skull dancing through the trees." As he spoke, Liliana thought she heard hoof beats in the distance. "I have to go," she said. "Where the esis root used to grow?" She scowled. "How did you know…wait. 'Used to grow?'" "You don't know? They burned it." "Their skin-witches did. It's a circle of ash now, where they chant their rites and raise more soldiers to fight your father." Turning her back on the strange man, she ran, heedless of the noise she made as she tore through bushes and stumbled over roots. She smelled the smoke long before she reached the glade, and stopped her rush when she saw the light of gleaming embers. A raven's wings beat the air behind her, and she turned. The golden-eyed man stood, looking down at the ground. "So much death," he said. Liliana dropped her gaze and started in surprise when her eyes met those of a dead man lying at her feet. Corpses littered the ground—soldiers in her father's colors, black and gold. Some clutched horrible wounds, some carried terrible burns, and some were headless, their skin flayed off their glistening fat and muscle by the skin-witches' dark magic. Not one carrion bird flapped among them. "And without the esis root," the man said, "your brother will be next." "No!" she cried. "I'm not going to let that happen." "No, you're not." The steady certainty of his voice only exacerbated the panic that pounded in Liliana's chest. "There has to be another way," she said. "More esis root…another glade." "You know there isn't another glade." "What are you saying?" Liliana fought the urge to slap the infuriating man. "You know another way to save Josu? What is it?" The man pointed in the direction of the glade. She turned and looked into the trees, where a dim glow of embers smoldered in the darkness. His voice was right behind her, his breath in her ear: "You know." But she didn't know. For years she had studied faithfully at Lady Ana's side, memorizing the healing properties of roots and herbs, learning the signs and symptoms of hundreds of illnesses and the best treatment for dozens of kinds of wounds. Esis root was the only possible cure. "You said the glade was burned, the root gone." "You know more than that." All of her studies, her lessons, the daily routines of crushing herbs and mixing potions—nothing else suggested a possible cure. Of course! She nearly jumped at the unexpected thought. Over the years, she had expanded her studies beyond what Lady Ana could teach, dabbling in magic that took a more…direct approach to life and death. All in service to her work as a healer, of course. She knew magic that could turn even a burned and shriveled esis root into a cure for Josu. At least in theory. "I'm not ready," she said. "I have so much more to learn." "I'm sure Josu will wait while you complete your studies." Liliana swore violently under her breath and pulled away from the man, taking a few steps closer to the burnt glade. He followed her, speaking right into her ear. "You can't afford to wait, Liliana Vess. You know enough now. You are already a great mage, though you won't admit it to yourself. And you will be greater still, once you embrace your power." Her panic was changing, turning into a heady rush of excitement. She was powerful, but she had always hidden her forbidden knowledge away, afraid of censure. To embrace it, damn the consequences—she had to admit that, like other forbidden things, exulting in her power sounded like fun. She wheeled on him, planting a hand on his chest and pushing him back. "How do you know so much about my magic?" She could feel the magic surge inside her, the chill prickle of death's approach. "I suppose both of us are more than we seem," he said. Liliana had always known it: she was more, so much more than anyone had ever seen in her before. And now she would prove it. She felt something inside her break free, like a dark flower blossoming in a deep swamp. Spells came to her mind, weaving together into a desperate, terrifying plan. "Yes," the man said. "You see it now. Esis root is a powerful cure, but it was the safe course. You know a mightier one." She did, she realized with surprise. Stretching out her senses, she felt the power that brewed in all the rot and decay of the nearby bog. She drew the mana into herself with a grim smile, only vaguely aware that the strange man had vanished again. With each step forward, the power that had broken free inside her seemed to blossom a little more, solidifying her resolve. It propelled her, urging her to embrace her strength. A dozen paces brought her out of the sheltering trees and into the clearing. It was now a blasted circle of ash with smoldering embers in a ring around the edge. Terror struggled with fury in her heart as she took in the scene, remembering the peaceful glade it had once been. Three withered crones stood back to back in the center, eyes closed as they sent their spells winging through the wood to the battlefields across her father's lands. Three ghastly sentinels—grisly skulls with dangling bits of flesh, sickly purple light gleaming in their empty eye sockets—floated around the periphery. Six foes, and Liliana stood alone. But Josu's life depended on her, and the power blossoming within her was more than enough. One of the floating skulls bobbed toward her, a ghostly shriek rising from its gaping, fleshless mouth. She answered it with a chant of her own, a string of low syllables that echoed in the dead air. A knife of utter blackness shot from her outstretched finger and stabbed through the skull, severing the necromantic energy that gave it the semblance of life, and it tumbled to the ground. The skin-witches opened their milk-white eyes and turned to her as one. Twice more, Liliana pointed, and the two remaining skulls fell into the ash, kicking up little clouds where they landed. "I think you need some stronger bodyguards," she said. Her confidence was building, replacing her fear with cold resolve. She was good at this, she realized. It was so easy, once she embraced it. So much easier than her dreary studies under Lady Ana. And it felt so good! The skin-witches began a chant, their three voices speaking as one, and pain danced over Liliana like claws tracing marks in her flesh. But she turned her scream into another spell, using the pain to focus her mind. The spell rolled from her mouth like the tolling of a bell, and a deathly chill soothed her burning skin as her magic took shape. Three spectral hands floated up from the ground at the crones' feet, trailing wisps of shadow like ghostly arms. Now it was the witches' turn to howl in pain as the hands disappeared into their chests and emerged from their backs, clutching glowing motes of golden light. Their screams turned to pathetic moans as they sank to the ground, clutching their chests with what little strength Liliana's spell had left them. 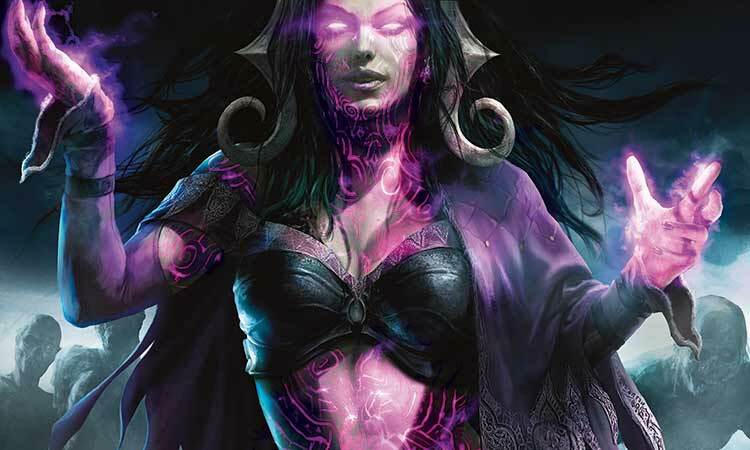 One skin-witch stretched out a hand toward her and mumbled something that might have been a spell, but Liliana felt nothing. The three spectral hands converged on one spot near Liliana's feet and dived back into the earth with their prizes. With a smirk, Liliana started to bend down, but the harsh croak of a raven behind her startled her and she spun around. One of the corpses she'd seen outside the glade was on its feet now, shambling toward her. "So you cast a spell after all," she called to the skin-witch behind her. "A valiant effort, but I think it was your last." With a deep breath, she focused her will and simply snuffed out the semblance of life that animated the zombie's flesh. Behind her, the witch gave a strangled cry. Liliana looked down at the soldier's body, his torn armor, and his blood-stained uniform. "So much death," she said. She lifted her eyes and met the gaze of the raven perched above her. "And this is just the beginning." At her feet, a golden glow emerged from the ash where the spectral hands had sunk. Sinking to her knees, she plunged her own hand into the ground and seized her prize. When she lifted her hand again, it clutched a shriveled, blackened chunk of esis root, glowing softly gold. It would make a potion far more powerful than what she'd originally planned, infused with the life she'd stolen from the skin-witches. The man had been right—she'd known what to do. Of course she'd known. Cradling the root to her chest, she walked back into the forest toward her father's house. She grinned up at the bird as she passed it. "Thanks, Raven Man." The blackened esis root made a potion that glowed gold like dawn warming the morning fog, reassuring Liliana of the life-giving power it held. She cradled it in her palms as she drifted through the clamor of the house, contemplating the light that had come from her dark magic. The servants bowed and backed away as she approached, but quickly resumed their shouting and scrambling behind her. She ignored all the cries, convinced that the elixir she carried would soon enough bring an end to all the worry and commotion. "Lady Liliana has returned!" one servant called out ahead of her, and at last she looked up. She stood in the hall outside Josu's room. In answer to the servant's cry, Lady Ana stepped out of the room and put her hands on her hips, frowning at the vial in Liliana's hands. "That's not esis root," the healer said. Liliana paused, her confidence faltering in the face of her imperious teacher. But then she heard Josu cry out in the room—"Skulls! Skulls floating through the trees! "—and she remembered what she had gone through to make the potion and what was at stake. She straightened her back and met Lady Ana's imperious gaze. Ana scoffed. "I'll be the judge of that. How did you make it? What are the components?" "This is no time for an examination. Josu is dying!" "The administration of curatives is not to be rushed," Ana said, folding her arms over her chest. "Some potions can do more harm than good." Her eyes flicked down to the vial in Liliana's hands and her lips curled. "The witches!" Josu cried from his bed. "No, no, the flames!" "I made it from esis root," Liliana said, "but I enhanced it." "The burning!" Josu was screaming, and Liliana could hear the hubbub of servants trying to calm him, to cool his fever, to bring some measure of relief to his torment. "Stand aside, Lady Ana," she said. "Josu needs to drink this. Now!" Ana drew herself up, her face reddening. "An apprentice does not address her master that way." Liliana took a deep breath, steeling herself. It was not just power blossoming inside her—she was opening, her mind expanding, her true self coming to the fore. This was her time. Her brother's life hung in the balance. She knew what she needed to do. "Then it's time for my apprenticeship to come to an end," she said. "Your power is no match for mine anyway." "Power? The healing arts aren't about power." "You don't think so?" Liliana laughed. "Stand back and watch." She pushed past the healer into her brother's room and fell on her knees at his bedside. "Stay away from my patient!" Ana snapped. All the long years of her apprenticeship, that voice had commanded instant obedience, and Liliana almost backed away out of pure reflex. But Josu seized her hand and looked at her—no, past her—and everything else faded away. "Josu?" she murmured. "Can you hear me?" "The witches," he said. No longer yelling, he sounded like a frightened child. "They stripped the skin…." Liliana lifted her glowing vial, and its golden light glimmered in Josu's eyes as he stared at it. "Drink this, Brother." She lifted it to his lips. "It will bring you rest." "Don't!" Lady Ana made one final protest, but too late. The potion filled Josu's mouth, and a gleaming golden drop spilled down his chin. For a moment fear twisted his face and Liliana worried he might spit out the precious liquid, but then he swallowed, and again, and one more time. Then his eyes closed and he settled back on his pillow. His only movement was the slow rise and fall of his chest as he breathed. Liliana smoothed his hair away from his sweaty forehead, and the hint of a smile came to the corners of his mouth. Behind her, one of the servants gave a strangled gasp. "He knows her!" the woman said. Lady Ana harrumphed. "Fine. You've calmed his sleep. Now you can tell me…." "Lili!" Josu shouted. His eyelids opened wide to reveal two jet black orbs. For an instant, she saw her face reflected in them, but dead—her own eyes rotted away, her skin drawn tight over her bones. He stiffened, his blank eyes staring up at the ceiling. 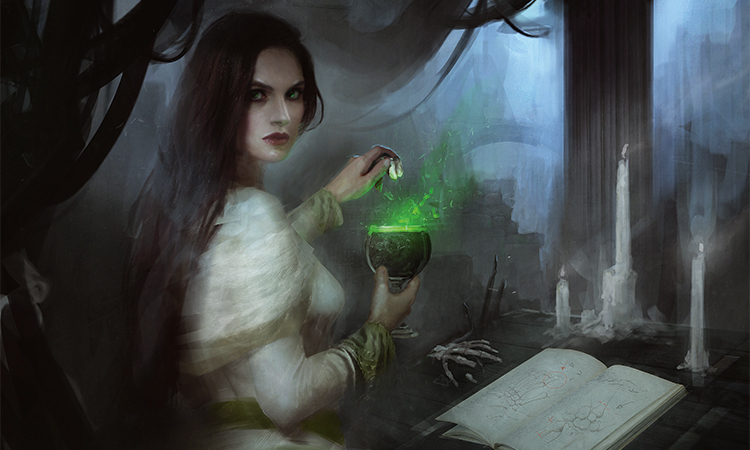 Liliana noticed a blackened spot on his lip—where her potion had dribbled from his mouth. As she watched, he seemed to shrink. His eyes sank back into his skull and his pale skin grew waxy and tight. His cheekbones jutted from his face and his lips drew back away from his teeth. "What have you done, child?" Lady Ana whispered. She shouldered Liliana aside and bent over Josu's still form. 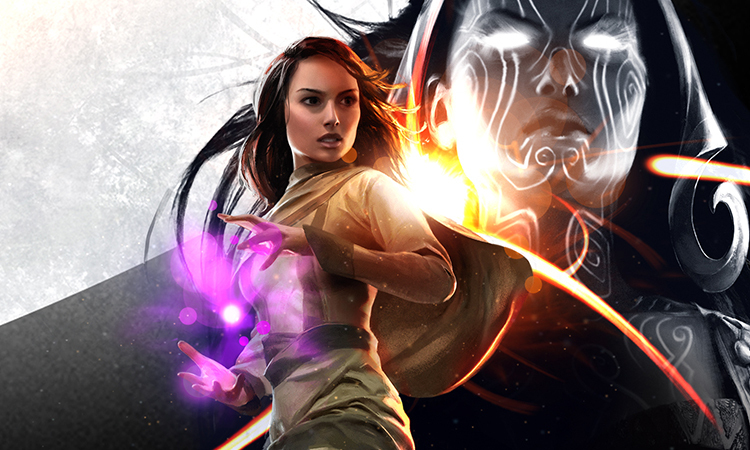 Liliana drifted to the foot of the bed, her mind reeling as she stared down at her brother. What had she done? The potion—her potion, brewed by her skill and her magic—hadn't cured him at all. It had killed him. All her efforts…and the result was worse than if she'd done nothing at all. Lady Ana stood up from the bedside, her face grave, and began shooing the servants out of the room. Liliana sat on the edge of the bed next to her brother, pressing his cold, rigid hand between hers as if she could restore its warmth. Then his hand wrenched free of her grasp and seized her throat. Sharp nails bit into her skin. "So much pain…" Josu said. He sat up, bringing his face right next to hers. "Where have you sent me?" he asked. The foul air of his breath stung her nostrils even as she fought to inhale, trying to pry his fingers off her neck. "So…much…pain!" 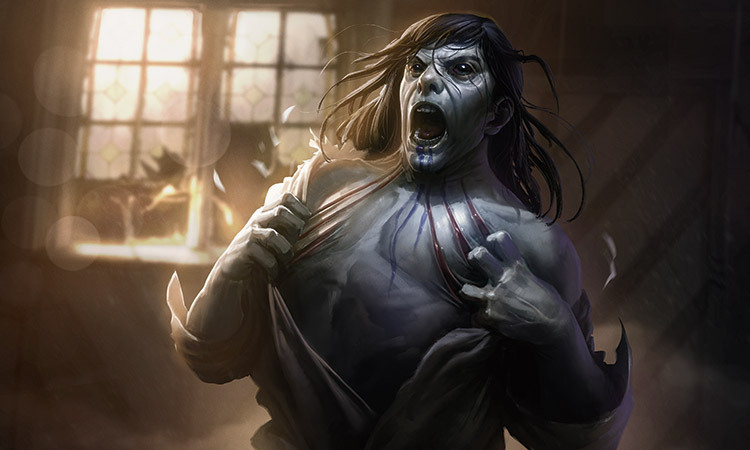 he screamed, and threw Liliana against the wall. She crumpled to the floor as Lady Ana shrieked. "Josu," Liliana whispered, "I'm so sorry." "Sorry!" He staggered to his feet and lurched at her. "You damned me, Sister!" Glaring at her, he brought his clawed fingers to his own neck. "Damned me to endless torment!" He raked his nails down his neck and onto his chest, tearing skin and cloth alike…but not a drop of blood welled in the gashes. "Torment!" Bracing herself against the wall, Liliana fought her way to her feet, edging away from him. But despite the stiffness of his limbs, he was fast, and he caught her neck in his hand again, pressing her back against the plaster. "Let me help you, Josu," she pleaded. "Come back, come back and we'll make this right." "Help me?" His voice was a growling whisper in her face. "I am lost to the Void, Lili. Lost! So why do I linger here?" "I don't know, Brother. I don't know. But we'll fix it. Trust…." He tightened his grip and choked off her words. "Trust you? Trust you? No!" "Let go of me," she croaked. "The Void will have you, Lili. Its hunger will never die. It will have us both." "Let me go," she said again. Her terror and grief burned away, leaving only cold anger. Memories of the moss-draped trees, clammy air, and reeking water at the heart of the Caligo flitted through her mind as mana streamed into her, chilling her blood and prickling her skin. "I'll never let you go, little sister. Not anymore. We'll be together, you and I. Joined in this eternal agony!" "Let go!" Liliana's fury erupted into a blast of livid darkness between them, sending Josu toppling onto the bed as the plaster cracked and crumbled at her back. The shadows danced across his body then disappeared, seeping into his pale skin. He stood upright again, not so stiffly, and glared at her. "So my sweet little sister dabbled in necromancy," he said. "And turned me into this!" He thrust his hand toward her, and a fountain of shadows flew from his fingertips. She threw her hands up to protect herself, and the shadows pierced her, tearing at her soul and smashing into the wall behind and around her. Though it left her bitterly cold, Josu's spell didn't harm her as much as it damaged the wall. As the support at her back crumbled into ash, she stumbled and fell amid the debris. Liliana was dimly aware of the chaos erupting around them, the household staff screaming, running, whimpering in pain or crying in grief. How did it go so wrong? she wondered. She had exulted in the blossoming power within her, but now it seemed to collapse in on itself, leaving a desolate void. No, she thought. I have to make this right. Scrambling back as he strode at her again, she tried to think of a spell that could undo what she'd done, somehow take his twisted semblance of life and ignite it into true life again. In the meantime, though, she had to keep him away from her. She tossed spell after spell at him, blasts of darkness and grasping claws of shadow. Over and over he howled in pain, leveling an endless stream of invectives at her. Instead of stopping his advance, though, her spells seemed to make him stronger. Which made sense, she realized. The magnitude of the lies she had told herself became clear. All this time, she had believed that she'd been studying necromancy from her secret books and doing dark research in order to aid her healing arts. That she could turn the power of death to the service of life and health. That a healer should use every tool at her disposal. But Josu was the result, a horrible fusion of life and death, and all her spells meant to manipulate the life force of the living could do nothing to harm the dead. And Josu returned every spell with one of his own, smashing walls and shattering windows. Stray blasts, deflected from their intended targets, struck servants and withered their flesh, melted their bones, or consumed their souls. So much death, she thought. And unless I think of something soon, I'm next. Josu's relentless assault was taking its toll on her. The mana that suffused her and fueled her magic seemed to dampen the effect of his spells on her, but it wasn't a perfect shield. Her hands were cold, her limbs stiff, and her thoughts slowing as the magic of death sapped her strength, body and soul. Josu—the thing that had been Josu—stretched out his hands and shadow engulfed her. Claws of darkness clutched at her, lifting her from the ground and snatching at the motes of life and strength that remained in her body. She choked as shadows reached into her mouth, seizing the breath right out of her lungs. She felt as cold as death itself, suffocating as though she'd been buried alive, trapped in the viselike grip of her brother's magic. He stood right in front of her now, looking up into her eyes, his clawlike hands upraised as if they, not his spell, were holding her in the air and squeezing the life from her. "Join me, Lili," he said. "All the torment of the Void will be ours to share forever." Her eyes pleaded with him, but not a glimmer of compassion lit his lifeless black orbs. Finally she closed her eyes, unable to look upon the horror she had created. Death closed in on her and her head swam. Then, in her moment of utter desolation, something inside Liliana caught fire, a spark of infinite darkness, at once colder than the grip of death and hotter than the sun, dark and endless as the Void but eternally alive, an infinity of possibility, the power of creation itself…and annihilation. She snatched at this new power, seizing this last shred of hope. Her soul burned in exquisite agony, and Josu's magic dissipated, unable to contain her anymore. She opened her eyes and saw Josu recoiling from her, his shrunken face twisted in shock. As Josu struggled against the press of undead flesh, something pulled at her from behind. Whirling around, she saw the ruins of her father's house change. The walls twisted and split, forming dark tree trunks under a shroud of black leaves. Clouds of dust became billowing fog, and the rubble-strewn floor turned into swampy ground strewn with dead leaves and gnarled roots. Her feet didn't move, but she felt that she was being drawn through unspeakable eternities, plucked from the world she knew and thrust into a whole other world. Then her home was gone, Josu was gone, the zombies, everything she knew was gone, and she sank to her knees on the swampy ground. More than a century later, an old woman stepped from one world into another. The years were a burden on her shoulders as heavy as her grief. The rumbling voice greeted her before she had fully left the other world behind, and with her first step on the marble floor of the great hall, she felt it vibrating with the power of the voice. "Not yet," Liliana said with a smirk. "Not ever, if you can help me as you promise." Gazing ahead at the prospect of death—as mundane a death as could be imagined, withering away from age—she had come to seek the aid of the one being in all the planes powerful enough to keep it at bay. The floor shook again as the dragon chuckled, and Liliana turned to look at him—turned, and raised her head, and stepped back to see more, and still his enormity filled her vision. As vast as the hall was, the great, curled horns atop his head scraped the ceiling and his outstretched wings reached the walls on either side. She suppressed a scowl—Nicol Bolas was trying to intimidate her, to remind her who held the upper hand in their negotiations. Worse, it was working. "I can help you, Liliana Vess," Bolas said. "But immortality is beyond the reach of us all, now." "Says the thirty-thousand-year-old dragon." Liliana turned her back on him again, staring down at her hands. Creased and spotted with age, her skin hung loose on her bones. She stood as straight as she could manage, unwilling to display her body's frailty in front of the mighty dragon. But it was not just her body—her soul was a withered bloom, bereft of hope. "How we have fallen," he said. "Once, we were gods, working our private havoc through planes known and unknown." His words stung. They were Planeswalkers, not gods, but in those first years there had not been much difference. The spark that had ignited in her heart had unlocked greater power than she could ever have imagined, making her immortal and virtually omnipotent, putting the endless ranks of the dead firmly under her command. She had walked the numberless planes of the Multiverse for decades, exerting her will, her whims, on worlds that were powerless to resist her. Only one thing, in those days, had seemed beyond the reach of her magic: undoing what she had done to Josu. Then the Multiverse reshaped itself, robbing her—and every other Planeswalker—of the godlike power they once had wielded. Some called it the Mending, as if something broken had been repaired, but to Liliana, it seemed the opposite. It broke her beyond any hope of repair. She had spent decades working to regain even a fraction of the magical might she had lost, and it was not enough—not enough to keep death at bay. Josu had promised that they would be together in death, sharing his eternal pain, and Liliana would never let the icy claws of death fulfill that promise. 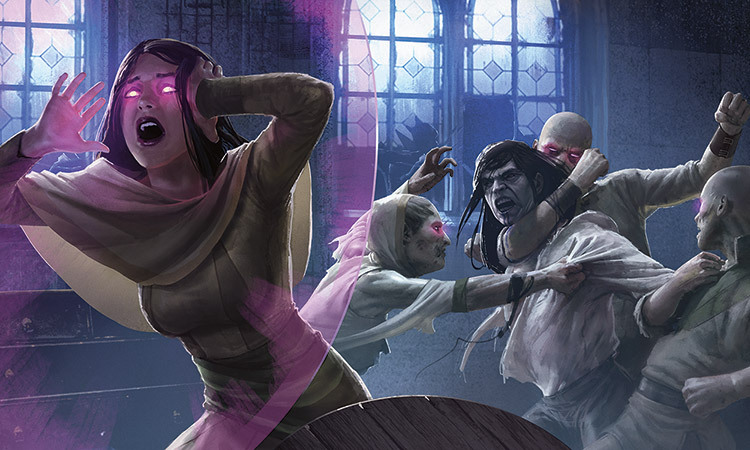 "You have not fallen so far," Liliana said, unable to keep the bitterness from her voice. "Then give me a hundred!" Liliana whirled on him. "Look at me, Bolas! I can feel death breathing down my neck." "Perhaps that is because it has been such a close companion all these years." "Not a companion, a tool. Something to be inflicted on others, not embraced." "I'm sure some of your old teachers would disagree." The floor rumbled with the dragon's amusement again. 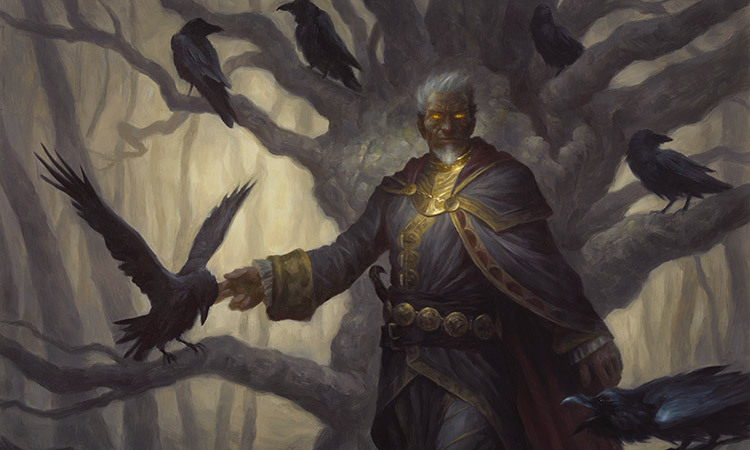 "Surely you learned from vampires when you went to Innistrad, studied with liches—the masters of necromancy. They would have you embrace death and move beyond it, not fear its approach." As Nicol Bolas spoke, he lowered his head closer to Liliana's and turned so that she saw her face reflected in one huge, black eye—wrinkled and drawn, her beauty faded, the specter of death haunting her eyes, not too different from what she had seen in Josu's dead, black eyes all those years ago. Liliana turned away. I am more than I seem, she reminded herself. "A queen doesn't rule her people by being one of them," she said. "If I'd wanted to go down that path, I'd be on Innistrad right now, not here. So can you help me or not?" "As I told you, I can put you in touch with the beings that can help you." "Four demons, you said. And the cost is my soul, right? Payable upon my death?" "It's not quite that simple." "Of course not." Liliana sighed. "Nothing is ever simple with you, is it, Bolas?" "On the contrary, many things that your mind can't even begin to fathom are quite simple to me." She snorted. "Your modesty is truly breathtaking." "A simple statement of fact, Liliana Vess. After all, you are merely human." "'Once, we were gods.' I need that power back, Bolas. Power and youth and strength. Even if it costs my soul." "Good." The dragon's breath was close, scalding the back of her neck. "But a soul isn't a trinket you can hand over to a demon, or an ember it can seize upon your death. You'll give up your soul, all right—because no one with a shred of soul could possibly undertake the tasks you will perform to pay off your debt." Liliana tried to suppress a shudder. "But why should that bother you," the dragon said, "after all that you have already done? You have studied with the greatest necromancers on all the planes. You slaughtered angels. And you bested the one who started you on this path. What did you call him? The Raven Man?" Liliana nodded absently, thinking of her first encounter with the Raven Man, all those years ago, and the terrible events that followed. She had bested him, as the dragon said, but not killed him—not yet. "Perhaps you have already given up your soul," Bolas said. The prospect did bother her, Liliana realized with some surprise. Bolas was right. Since her first encounter with the Raven Man in the Caligo Forest, when she had embraced her power and let it steer her, her life had been one moral compromise after another, an inexorable slide into darkness. What was left that separated her from the wickedest villains in the Multiverse? Just this moment, she thought, this one instant of hesitation. Liliana turned and stared into the dragon's unblinking eye. "Let's get this over with." 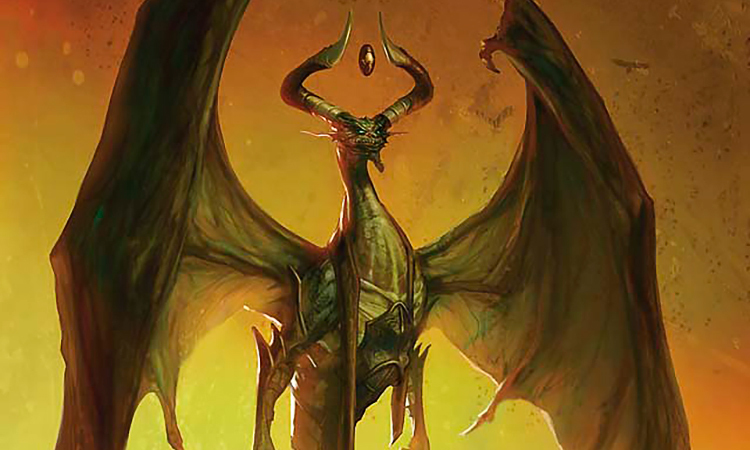 For the fourth time, Nicol Bolas led Liliana from his great marble hall to a plane she didn't recognize. After forging three pacts with three different demons, power surged through her body—yet she was still a rag doll in the dragon's claws. And she was still old. The dragon deposited her in another great hall. Leaping flames filled an archway in front of her, but as Bolas withdrew, the flames died down and the fourth demon came—slithered—into view. In place of legs, he had a bulbous tail trailing behind him into the fires. His bestial head jutted forward from his hulking shoulders, dominated by a leering grin that showed his sharp teeth. Two horns, surmounted by an elaborate headdress, swooped out to the sides from a tawny mane. Tattered, leathery wings stretched out from his shoulders. And his long arms trailed sharp claws almost to the ground. 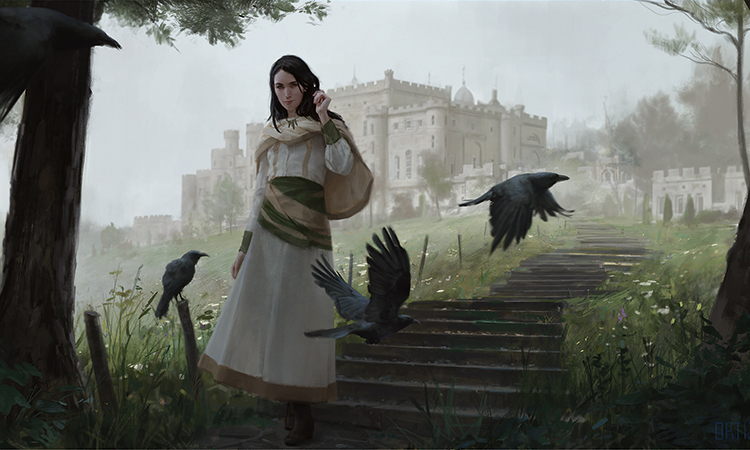 "Liliana Vess," he said, stooping so his breath washed over her face. His voice was a harsh whisper, and a serpent's tongue flicked out between his teeth as he drew out the end of her name. "I am Kothophed." "And you know my name, so I guess that's the end of our pleasantries." The demon barked a short laugh. "Indeed. And I understand I am the fourth of your patrons. Did your other agreements meet your expectations?" "I am satisfied." Bolas had warned her against telling any of the demons about the others, and she tried to keep even the thought of them from surfacing in her mind. "Are you? Shall we forego our arrangement, then? You have all you desired?" She smirked. "I am satisfied with the benefit I reaped from each previous agreement, and I'm sure I will be satisfied with this one when it's complete." "That's not enough," she said. 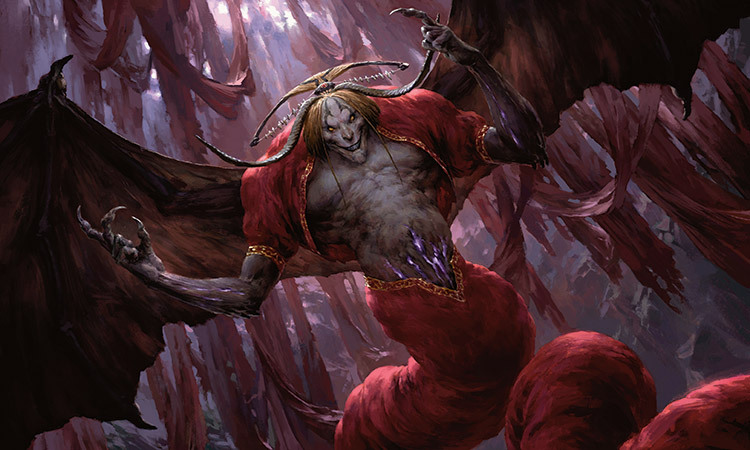 Bolas had warned her, too, that if she tried to renege on a bargain, the demons would be free to kill her, and even with the power she'd gained, she doubted she was a match for Kothophed. Dark mana radiated from him like heat from a bonfire. "So hungry for immortality," the demon said, slithering forward and around her. "But you've gained power enough to sustain your life for decades at least, maybe a century. And you could have your way with the Multiverse in the meantime. Is that not enough?" "Holding death at arm's length for whatever years are left to me? No, that's not enough. I want to be free of its shadow." Like I was before Josu, she thought. Young and alive and blissfully unaware of the number of my days. "But you have already embraced death," the demon said, now behind her. "You've taken it into your soul, stitched it with your Planeswalker spark, woven it into every shred of magical power within you. It casts a very long shadow over you, my dear." "Everyone's death but my own," she said, more to herself than to the demon. As she spoke, the room melted away around her and she stood on a barren plain. Corpses littered the field as far as she could see, and ravens hopped from body to body, picking at the tastiest bits. "I am your death," Kothophed whispered in her ear. "Kill me, and you will never die." She whirled around, a spell forming on her lips, but the demon was gone. She heard his barking laugh from behind her again, now a dozen yards away. 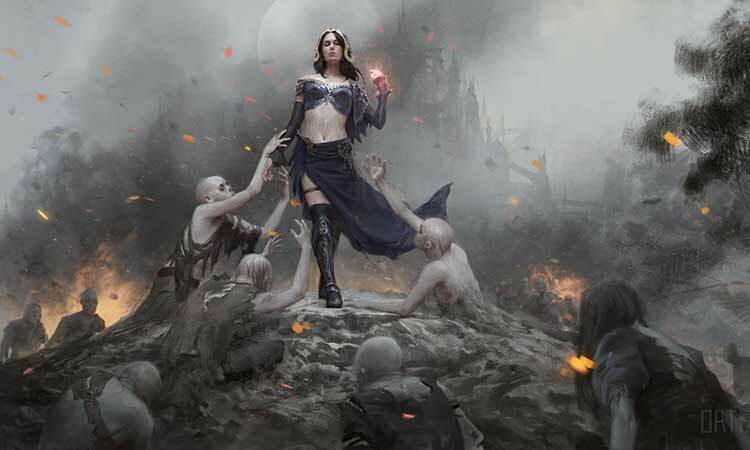 Liliana stretched out her hands and black birds rose in a storm of flapping wings as corpses across the battlefield lurched to their feet and shambled toward the demon. Kothophed surveyed the field as if counting the zombies, his jackal's grin unwavering. "Impressive," he called. Then two flicks of the demon's tail sent bodies—lifeless once more—scattering in every direction. "Just a warm-up," Liliana called back, trying to hide her fear. Bolas had told her the demons had agreed not to kill her, not as long as she held to the terms of the bargain. But Kothophed had seemed eager to break that deal from the start, and this battle didn't feel like a test. As Liliana found the rhythm of her spellcasting, she slowly rose from the ground surrounded by an Aura of shadow. She grasped at the demon's life energy herself, trying to draw power from him to fuel her own magic. Kothophed slithered closer to her in response to her pull, and then a wave of power surged out from him and knocked her backward. Wave after wave of grasping shades, shambling zombies, and specters on great winged shadows answered her frantic summons and rushed at the demon at her command, only to fall at Kothophed's tail, swordlike claws, or gnashing jaws. But they bought her time—time to shape a horror from the bones and flesh of the fallen, a venom-spewing monster with the soul-sucking claws of a specter and the sheer strength of a titan. For a moment, she thought that Kothophed was actually struggling with the creature. The demon wrestled with it, surging closer to Liliana as the two monsters grappled in a tangle of limbs, claws, and fangs. But as the demon came close, it was clear who was in control of the fight. Kothophed seized the horror and pulled its limbs apart, depositing them at her feet. The demon's cold breath numbed her skin. His claws bit into her flesh. He held her in one great hand. With the other, he drew one claw from the crown of her head to the toes of one foot, slicing deep, scraping against bone. She screamed. The incision made, the demon peeled back her age-worn skin, pulling it off her like a rabbit's hide. But what Liliana saw beneath was a younger body, slick with blood but supple and smooth. Kothophed set her back on her feet, and she felt solid marble beneath her. The charnel field melted away and she stood once more in the demon's pillared hall. She looked down. Her black gown remained in place. But her skin, her shape, her posture were those of her younger self, beautiful once more. "What," she spat, "was that?" The demon laughed, long and loud. "If that was supposed to be a test," she said, "then clearly I failed. So why am I still here? Why do I look like I do?" The demon stifled his laughter and lowered his face until his yellow eyes gazed right into hers. "It was not a test. It was a lesson—one I trust you will never forget." He reached a claw toward her face again and she winced in anticipation, bringing another barking laugh. "Hold still," he said. "I'm not done with my end of the bargain." His touch was more gentle, but still agonizing, as he traced the claw in whorls across her face. "You are a Planeswalker," he said as he worked. "That makes you special. You are also one of the most powerful mages in all the planes, and that makes you extraordinary." Yes, she thought. So the Raven Man said. Done with her face, Kothophed moved on to her neck and shoulders. "But next to me, you are nothing. Your mightiest spells could barely touch me. Your merely human mind will never match mine." You go ahead and think that, she thought through the pain. The demon had meant to crush her, but the power inside her was blossoming again, brighter and stronger than ever. It was worth the agony. The lines traced by Kothophed's claw didn't bleed, but they glowed with pale, violet light as if the power they granted her was spilling out. Despite the agony, despite the demon's threats, she felt the shadow of death recede from her. She was young and powerful, and she would stay that way for ages. Or until the demons came to collect the debt she owed. But some part of Liliana knew that Kothophed was the one who should be afraid. She was more than she seemed, and the demon had underestimated her, like so many others before him. It was her destiny to overthrow the demons that claimed her. She knew it, as if the knowledge were a part of her flesh. As if Kothophed, unwitting, had woven that destiny into her being. It was written on her skin.